Transplants the seedlings at a very early stage in the growth and also plants it singly not in bunches. Plants in a square pattern at 10″ intervals. Keeps soil moist, well aerated and composted with no, or minimal, use of chemical fertilizers. This is only the short list as it has several other great attributes. The most notable being, it needs less water, less pesticides, does not need bio engineered seeds, and it greatly increases yield. Sumant Kumar of Darveshpura, Bihar, India was featured in a great article from The Guardian. 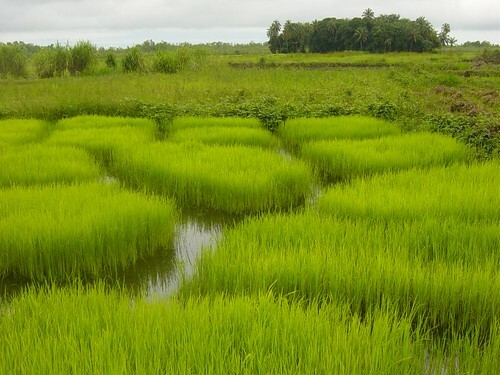 He managed to more than quadruple his rice yield and break the world record with 22.4 tonnes on one hectare of land . This is with only hand tools and animal manure. Problem with this technique is that it does not conform to standards well and is therefore hard to classify and quantify. Also known as if we can’t reproduce it easily and at a profit for us then we don’t want it. Luckily India has been a great supporter of this farming technique and it has even spread beyond the rice culture and into wheat, kidney beans, millets, mustard, sugarcane, grams, and vegetables. The SRI-Rice page from Cornell University is a treasure trove of information on the subject. Also look at their video resources.